Personal scan. Hardboiled, huh? Very 1920s. 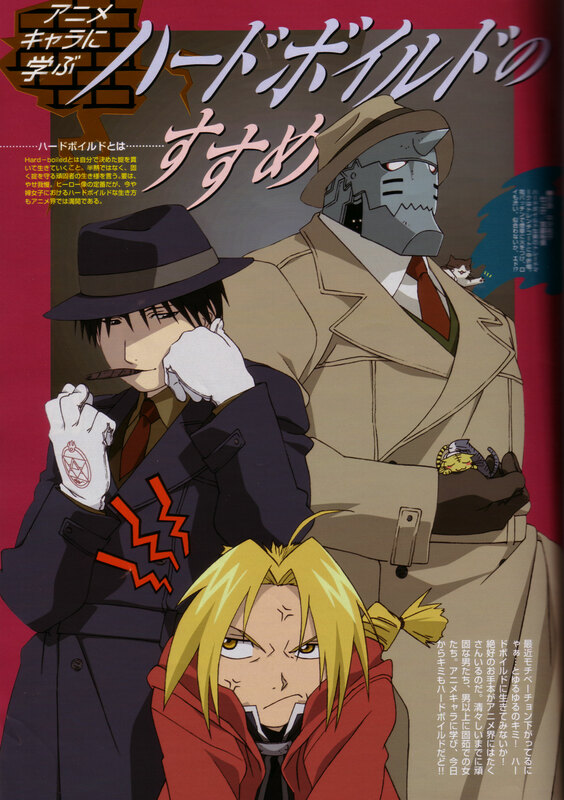 Scan from Animedia 5/04. HA HA! I love the fact that Roy is lighting up his cigar with his spark glove. :) Too bad Ed didn't dress up in a tenchcoat like Roy and Al. Ed would be the criminal, then? :) Hehe~ they look so cool like that. XD Thanks for sharing! Ha, Ed isnt short, he's travel sized ^__^ I love this picture, very funny. Roy using his fingers to light the cigar XD Though I have to admit, if I saw Al walking down the street dressed like that , I'd attack him with a baseball bat ^^;; He looks cool though XD -clings to Ed- Love the pic! Awww, that's just too cute. I feel sorry for Ed. Him and his shortness. ._. Roy and Al are looking quite spiffy in their suits though, I must say. Another great scan. I really like this picture too. Thanks for your work!